At Scholastic Classroom Magazines, we want young people to become engaged and empathetic citizens. This blog post is the first of three from the Classroom Magazines editorial team about how we tackle civics by grade level. Laine Falk is an Editorial Director for Scholastic News. She and her team create the first- and second-grade editions of Scholastic News. Civics sounds like a class you take in high school. But learning how to be a good citizen starts even before a young child ever steps into a classroom. Civics is not just about learning the three branches of government or what the city council does. It’s about learning how to be a good citizen in the family, the classroom, the neighborhood, the country, and the world. 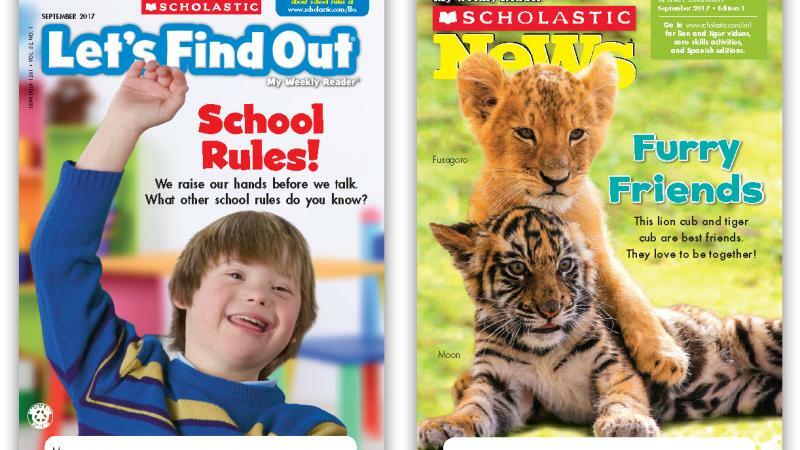 In Scholastic’s early-grade magazines, we always start the school year with articles about friendship and school rules. How should we treat each other in our classroom and on the playground? How can we show respect to our classmates and our teacher? How do we solve conflicts, such as two children wanting to use the same crayon? Kindness and respect may seem like nothing more than sweet, early-childhood topics to teach. But they are so crucial to the functioning of a healthy society. We’re not born knowing how to interact with each other respectfully; we need to be taught how. That’s why we suffuse our articles, all year long, with themes of good citizenship. “How many of you think we live on Earth?” asked the teacher. All the hands shot up. “How many of you think we live on Mars?” she followed up. All the hands shot up again! So we include maps of the United States and articles about American symbols such as the flag and the Statue of Liberty. These are concepts that can be confusing for young children, but when teachers introduce these concepts in age-appropriate ways, children gain a better understanding of their place in the world. Our issues about civics continue throughout the year. We teach kids about veterans and the jobs they do for our country. In the early-childhood magazines, we talk to real veterans who are also moms and dads, making the topic relatable to our readers. We also teach kids about our country’s history in articles about George Washington and Abraham Lincoln for Presidents’ Day. We continue the history lessons with articles about Dr. Martin Luther King Jr.; kids learn that cruel things can happen in our country, but that people can stand up for their beliefs and work to make a change. We cover what it means to protest peacefully and how doing so is a responsibility of a good citizen. Another way that we cover civics is by keeping our eyes and hearts open to the society in which we live. We change with the times, and we strive to represent diversity, which is a great strength and beauty of our country. For example, in our Thanksgiving issues, we teach kids not only about the Pilgrims and the Mayflower crossing, but also about the Wampanoag, the people who had lived in Massachusetts for thousands of years before the Pilgrims arrived. In our second-grade magazines, we have even told several true stories from both the Pilgrim and the Wampanoag perspectives, which allows teachers to embed social-emotional learning (understanding point of view) in a history lesson. One big goal of our team is to make kids good citizens: citizens who are knowledgeable, who participate in the society around them, and who work to make that society better. Our readers are young, but they can understand a lot. And the future belongs to them.